COLUMBIA, Mo 4/21/14 (Op Ed) -- An article in The Atlantic this month explores a new "myth": paying your way through college. It used to be possible but now, not so much. One credit hour in 1979 at Michigan State University (MSU) cost $79.23 in today's dollars and took roughly eight hours of minimum wage work to pay for, the Atlantic piece explains. One MSU credit hour in 2014 costs five times as much: $428.75, and takes 60 hours at a minimum wage job to buy. "We should be outraged," people say. Outraged the American Dream is crushing instead of buoying our young. Outraged that a once-vaunted ticket to prosperity -- a college education -- is becoming a ticket to penury. Outraged that college presidents and university football coaches have become a new breed of one-percenter, while legislators cut higher ed funding and professors struggle with wage stagnation. But we're not outraged. Instead, we pay the bills with little more than muted grumbling. We don't demand results, like jobs for grads in their chosen fields. We express far too little consternation over the screwed up economics of the college diploma. Why are we so willing to go along? For a subtle yet powerful reason I call The Myth of the Priceless Virtue. In economics parlance, education -- and healthcare, too -- have become "priceless virtues," i.e. social goods upon which society refuses to put a reasonable cost ceiling. No matter how much a priceless virtue costs, we pay the bill. And if we can't pay it, we marshal the power of government. We erect vast government bureaucracies, filled with apparatchiks, to write the checks. For tuition. For hospital bills. For anything we deem virtually priceless. But there's no such thing as "priceless," or at least, there shouldn't be. To see why not, consider housing and food -- two absolute necessities, the most virtuous of all goods -- upon which we regularly put cost ceilings. There's just so much we'll pay for rent; so much for eggs and milk. Mortgage rates above 5% are unacceptable! And that $50.00 restaurant tab -- completely out of line. You don't see us building vast government bureaucracies to end hunger or provide clothes and housing. What bureaucracies did exist, we've mostly torn down. Why are education and healthcare "priceless virtues" but not food and housing? Nor clothing? Nor gas? It's not like there's no competition to drive down prices: Hospitals and universities go to great lengths to recruit patients and students. 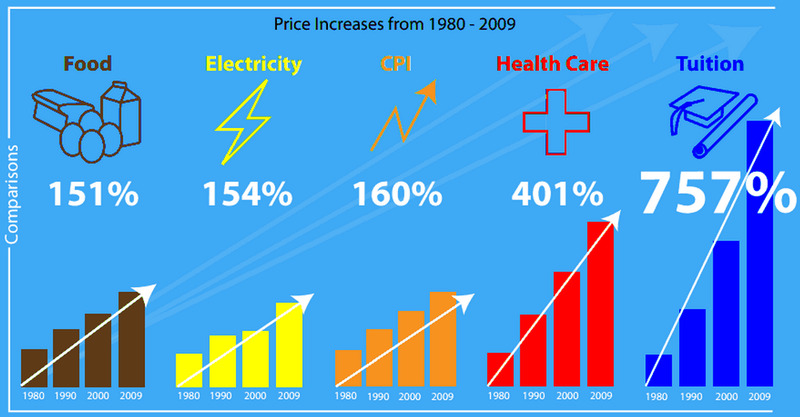 But competition will not reduce prices unless consumers demand it. So why don't we demand lower healthcare and education costs? How do we decide what does -- or does not -- merit priceless virtue status? I doubt anyone really knows. What we are finding out, however, is that social goods deemed endlessly virtuous become unbearably expensive, which is why they are little more than myth. Instead of virtues, they are vice grips, squeezing the life out of generations, societies, economies, and nations. The myth of priceless education and healthcare is a problem that cannot be overstated, especially as college and hospital costs crowd out consumer ability to pay for other wants and needs: food, cars, housing, even tech gadgets -- the goods and services that keep economies healthy. The most troubling facet of America's priceless virtue myth is that it threatens to squeeze the intellectual vitality out of our youth. How easy is it to innovate -- in the arts, sciences, or business -- under a Mount Everest of student debt? And what if the Affordable Care Act -- like so many other attempts to rein in healthcare costs -- fails? What then for our young people, whose taxes and premiums already prop up older -- and sicker -- generations? "What price virtue?" we should be asking. If we spent a fraction of the money we lavish on education and healthcare for affordable housing, healthy food, energy independence, and other social virtues, we wouldn't need Ivy League degrees to shelter us from poverty or a hospital on every corner to keep chronic diseases at bay. We can restore balance in our lives, but not until we tame the mythical beast in our midst.